Today I am thrilled to be participating in the Simon Says Stamp Falling for You blog hop, along with a huge host of other designers. You should have arrived from the blog of amazing Nichol Magourik. If not, head to the Simon blog to start at the beginning. The gorgeous Falling for You release contains lots of sweet stamps, dies and stencils, and my favourite of them all is the adorable Baby Party Animals stamp set. Yes, I just love critter stamps. :) So I made a pair of cards featuring these sweet sweet little animals. First up, a simple birthday card. I stamped the new Falling Snow stamp in Cotton Candy ink on Cotton Candy cardstock before die cutting with the Stitched Shapes frame die. Then I stamped my little monkey on some watercolour paper on which I'd painted a wash of brown paint. I cut him out, added a white face and pink cheeks then stamped the matching sentiment and banner on the pink panel before adding the monkey. Some Moonshine sequins finished it off. So simple. And next, a little baby girl card… because that bunny... eeek. Too cute. Love the way it looks like this little guy is waving hello!! Generous as ever, Heidi from Simon Says Stamp is giving away a prize package on every stop of the hop. That's a LOT of prize packages. Leave a comment here by April 28th to be in with a chance of winning. And be sure to comment on EVERY stop! Love all of these new "falling "patterns, lots and lots of uses! Cute cards! Adorable cards!! Love the colors and pattern papers you used!!! Real cute. Love how the animals take center stage. Both cards are so adorable! Love! This hop has so much inspiration including this stop. Wonderful job. Those baby animals are adorable! Your cards are darling! OMG I need to get this set! The baby animals are so cute!! Like the adorable Baby Animal stamp/die set. Like how versatile they are. Adorable cards! I love the tone on tone pink look to the first card. Oh my goodness how cute. Thanks for sharing these. Love your cute girly cards. This is so cute. I love the two papers together and the image is darling. Totally cute cards! Thank you for the chance to win! Both cards are so very sweet! I love the touch of tone on tone falling snow in the background of the first card. Love this release! A lot of new products to try and what a great line up of blogs with fabulous ideas. Thank you so much ladies for sharing your creativity with us. So very cute. Love the colors. Cute monkey bussines... Baby Party animals stamp set it's so versatile. Oh so adorable! I love them both, but the bunny is my absolute favorite! You are so talented Lucy! OMG... you always make the most adorable cards!! love these!! Both are sweet creation and these stencils having many possibilities!!! So cute, clean and simple. Love the tone on tone background! Very cute cards! The more I see this stamp set used, the more I like it! Thanks so much for sharing and for the giveaway! these are adorable! i don't use a whole lot of designer paper - but this is encouraging for me! I am fawning over how adorable these cards are! Thanks for sharing! I'm beginning to think this set is a must-have! Such cute cards! I love the clean and simple look and that monkey is adorable. Lovely cards! I liked seeing all the different background patterns in use. Two amazing cards...... such lovely pinks! LOVE! I love the tone-on-tone background in your first card! Not to mention...baby party animals are awesome! Sweet cards. I am going to have to get this set. Eeeeeek! How cute--love the simple look that showcases the stamps so nicely! that monkey card is soooo cute! perfect placement of the sequins! Nice cards, Lucy. That stamp set is adorable! Super sweet baby cards! Love them! Love your adorable cards! What an awesome new SSS release!! Hi Lucy. Your card is so cute. I thought you would make a shaker card with some of your beautiful sequin mixes which I keep meaning to order. Man that monkey is cute. The bunny really does look like it's waving! So cute! Thanks for sharing. super cute cards and I can see this stamp set is a hit. So cute. Love the soft colors. Such soft and sweet cards... The cotton candy pink is so on my must have list along with the falling star, snow and rain stamps... Just amazing! I love the soft colors on your cards. cute and lovely cards. Love your cute cards! I especially like your bunny with the cute pink cheeks! Great blog hop.... Seeing ideas from so many crafters, that I didn't know existed. What adorable cards! I just love the monkey one. Thanks for the wonderful inspiration! Adorable cards! Love this release. Love the card, simple but fun! I love your style so much! These cards are gorgeously beautiful! Clean and simple is what I like. Great cards. Love simple and cute put together. thanks to SSS for really cute new stamps. These are really cute. Love these stamps. Both these cards are adorable !! I love this release! Oh your cards are gorgeous. Just perfect - that bunny is very cute! Love your choice of pink. The party animal stamp set is just too cute. Great cards! Love the party animal stamps! So cute! I love both of your cards! I like that idea to use the bunny for the baby card. Thanks! Neat cards...monkey is so cute...makes me smile. My co-worker has a new baby girl coming. Can't wait to use the new stamps and dies! These cards are the perfect mix of cute and simple. Love! Darling cards! Such a fabulous release. Sweet cards! I have the falling stars stencil, but I definitely need the falling background stamps. I love the soft colors in these cards! Love the way you used the products. Such a cute card. You're right? That bunny is too cute! Great cards using the new release. Love the colors too! Your cards are so sweet and fabulous release this month.. i just love Lila’s stamps set and background stamps..Thank you and thanks SSS for the fabulous Blog Hop!! Such cute cards. The new release is great. WoW awesome cards as always love love them you are so talented. Great release TFS. I love the new release from SSS -there are so many choices for great card making. I really like what you've done. I love your use of patterns. Awesome! What cute cards for little ones. Love the colors. Super adorable cards! Thanks so much for sharing these have been a real inspiration! I'm really beginning to love these baby animals. All the cards have been so much fun. This card is great and fun and so colorful! I love color! Such adorable cards. I love this new release. Love this. So many great ideas! What gorgeous cards!! Those new background stamps are fabulous and, you're right, the bunny is to cute! Love both the birthday and the baby card you created from this great new release from SSS. Love your two cards using the Baby Party Animals. Thanks for the chance to win. So simple and sweet! I love the pinks. And I am never going to get enough of those stitched backgrounds. on your cards! Soooo sweet! Great cards! So romantic and so airy! Cute cards! Thanks for the inspiration! so cute! Love all the stencil in this release and those little critters are adorable! Cute cards. These stamps are so versatile. Just adorable, ty for sharing! Such great cards. I love all these new stencils and big rubber stamps. Very simple and sweet. I love these type of designs which are quicker to complete. Thank you! Both cards are really cute and wonderful. These cards are classic Lucy - love the pink and the clean designs. Love these clean & simple cards. The images are just too sweet. So sweet the cards you crafted to share today for the MEGA hop! I love the new stencils too! Wow you made great use of the products from this release! Supercute cards! Love your CAS take on these cards. Love those pattern papers, too. The critters are totally adorable! Thanks for the chance to win. Perfect ideas for all the baby cards I will need soon! These cards are so adorable and so simple to make! Love the baby animals! Such sweet and adorable cards! Loving the new release! Great card, nice technique, thanks for the chance to win the Giveaway. What cute cards you've made for this release! Very cute card for anyone! Really pretty colors! Love the one with the monkey! Isn't this just the sweetest bunny! EEEK, is RIGHT! I love him too! Your cards are sweet Lucy and I really like the cotton candy CS. Very pretty! Two sweet cards using so many of the new products, i must have some and I sure want them. Thanks for sharing your cards. Two simple useful cards that are so cute! Such BEAUTIFUL cards made Lucy! You always create fabulous cards! Love it! I love your use of color and pattern. This stamp set is adorable. I love critter stamps. Very cute cards. Very cute. Thanks for the chance of winning. Such sweet cards! This stamp set is so versatile. Love these new products. Thanks for sharing. the critters so rock...very cute cards!! Beautiful colors. I hadn't noticed that the circle sentiments have some good straight sentiments, also. A really versatile set! Love the simplicity of these sweet cards. Love the cards. Clean and simple but so pretty. Cute cards!! Simple yet very impressive!! These cards are right on my alley, I just love pink, and they so delicate and cute! These critters are so cute! Nice cards! 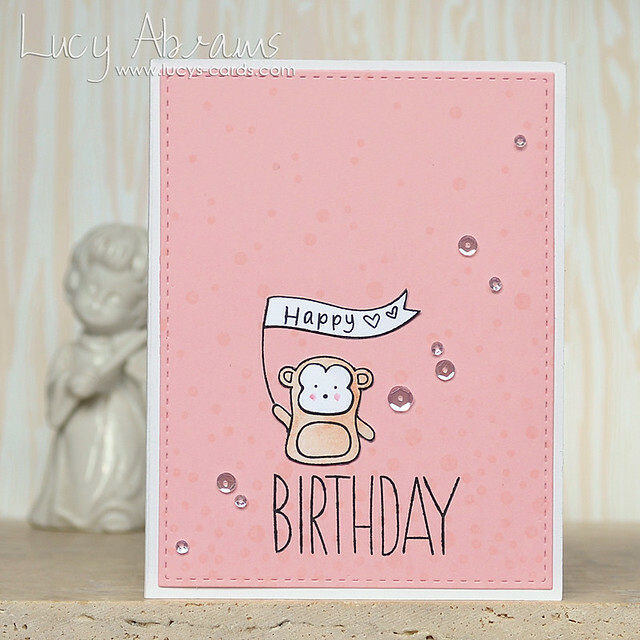 Super sweet cards, Lucy, love those adorable little critters!! Adorable cards. The Baby Party Animals stamp set is growing on me. Super cards with these super sets.